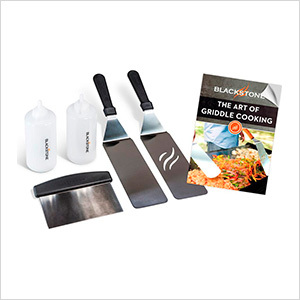 The Blackstone Tool Kit places the ability to move, flip, clean, and care for your griddle like a pro. Move large amounts of food quickly and accurately with professional stainless steel, long spatulas. A full handled scrapper allows you to scoop, move, chop food on and off the griddle as well and cleaning the griddle surface. Two sauce bottle, usually holding water and oil, allow you to add moisture and flavor on demand.